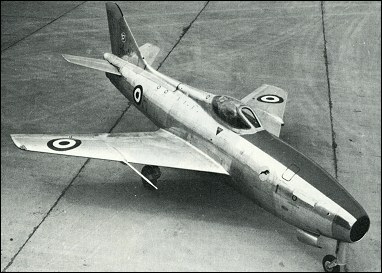 Basically similar to the Sagittario II, the Aerfer Ariete (Battering Ram) was built by Industrie Aeronautiche Meridionali (Aerfer), and represented the next step towards the development of the finally abortive Leone (Lion) mixed-power light interceptor fighter, which was being worked upon with the financial support of the US government. The Ariete had a deeper rear fuselage and, in addition to the Derwent 9, had an 821kg thrust Rolls-Royce Soar R.Sr 2 auxiliary turbojet, which improved overall performance. The Ariete prototype (MM 568) flew for the first time on 27 March 1958, but the entire project was later abandoned. Concerning the abandon of the Aerfer fighter projects, rumours are of lobby activity by U.S.A. (for the F-86 Sabre) and by FIAT (for its G 91). Very interesting plane. It had Hispano-Suiza HS-825 cannons which have scarce info on but I gathered enough. The Ariete had 240 rounds in total in those 30mms.